Vehicle wraps are a tremendous marketing tool for you to utilize that come with a wide range of benefits. By choosing to apply a vehicle wrap, you are essentially getting a moving sign that many more people will be able to see than if it was just in one solitary location. As great as a vehicle wrap is, there will be times when it will be in need of repairs. When this time comes, follow these tips to repair and maintain your vehicle wrap as quickly as possible. First, there are certain supplies you will need if your vehicle wrap needs to be repaired. The vinyl of your vehicle wrap requires particular tools and supplies to be able to properly repair any damages. It is recommended that you have a sheet of the vinyl you originally used to apply your vehicle wrap handy, as well as a heat gun, a squeegee, an exacto knife, a microfiber towel, sandpaper, a seal-it pen, and a spray bottle (although that is optional). 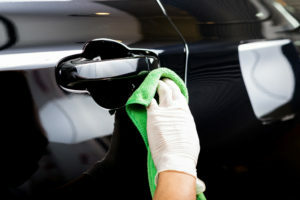 After you have gathered your supplies, you should clean your car before you do any kind of work to its body. You will then want to trim away any vinyl that may have begun to lift off and then use a sealing pen to seal the edges. After that, cut the vinyl you need to repair, the patch and squeegee the film over it while slowly pulling the liner out. Make sure you are removing any air bubbles that may pop up. You can apply the heat gun to the vinyl to make it easier to stretch if needed so that it may cover the area that requires patching. Once you have applied the vinyl, you can cut away any excess vinyl with a razor blade. After you have trimmed the excess, you will then seal off the vinyl to keep it firmly in place and make sure nothing may get past it. This entry was posted on Monday, March 25th, 2019 at 4:03 pm. Both comments and pings are currently closed.